In an effort to jumpstart the Belarusian economy and sidestep a Western sanctions regime, President Aleksandr Lukashenko is attempting to broaden cooperation with Moscow and Beijing. ­In a meeting with Grigory Rapota, secretary of the Russia-Belarus Union State, Lukashenko emphasized Belarus’ reliance on its historic blood brother in the east. 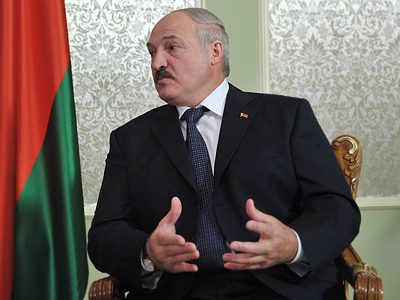 "Russia was and will always remain a strategic ally for us," Lukashenko commented on Monday in Minsk. The Belarusian leader, possibly in an effort to demonstrate his nation’s maneuverability, then broached the subject of Minsk’s relations with Beijing, the capital of the world’s economic powerhouse. Apparently, however, Lukashenko senses that Belarus may be getting the short end of the economic stick in the region. “We would want Belarus to be needed on this Moscow-Beijing axis,” the Belarusian leader stressed. “I think that [such cooperation] would also promote our joint activities in the framework of the Union State." Discussing his earlier meeting with the president of the China Aerospace Science and Technology Corporation (CASC), Ma Xingrui, Lukashenko continued to play the space card, betting it would open up doors with economic superpower China, which is beginning to make inroads into the great frontier. "We are ready to assimilate China's experience and achievements in this area and we are willing to offer our space services to China," he said. Lukashenko mentioned that Belarus supplied China with state-of-the-art remote Earth sensing equipment, “the same that is used on Belarusian spacecraft," he added. The Belarusian leader concluded with the hope that “cooperation in the space industry will advance to even a higher level, so that the people of our countries will be able to benefit from our peaceful space projects."